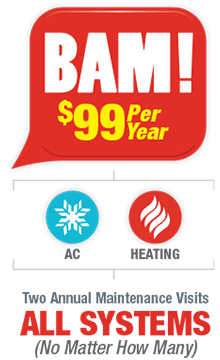 Get all your AC systems checked up for only $99/year with BAM! Includes one PRE-PAID* Spring/Summer and one PRE-PAID* Fall/Winter HVAC System Maintenance Visit by Certified Technicians. *Does not include any recommended parts & labor on recommended repairs, or Freon. If your home has multiple heating and air conditioning systems, you can already see how BAM! pays for itself with the first HVAC system maintenance visit. With Berkeys, value always goes much deeper than price – Value has to include quality and customer experience. Such is the case with the BAM!. The value of BAM! will only increase if you ever have an emergency repair job. Berkeys offers Preferred Scheduling & Pricing exclusively to BAM! Members. Start your BAM Membership now. It’s only $99 per year. When you do, you will join the thousands of satisfied Berkeys customers who enjoy the peace of mind brought by these annual heating and cooling system maintenance visits. Should an emergency arise with your heating or air conditioning systems, you will receive priority scheduling at no additional cost during business hours. Enjoy discounted pricing on parts and labor. We will tell you the cost in advance, so you don’t have to watch the clock or worry about surprising overtime fees. We perform a 30-point inspection and tune-up on ALL your Air Conditioning systems, no matter how many! Berkeys licensed technicians run a 29-point inspection and tune-up on ALL your Heating systems. Berkeys will track your HVAC system maintenance visits and contact you to schedule them. Check inside Cooling Coil, if accessible: Build-up on the coil reduces the system’s ability to cool, making your air conditioning run longer, increasing energy consumption and raising your cooling costs. Inspect Primary and Secondary Drains: A clogged condensate drain increases humidity levels and can cause ceiling damage. Check and Clean Condenser: Foreign material on the condenser reduces the system’s cooling capacity. A dirty coil will increase your cooling cost by 50% or more, and can shorten the life of your air conditioner. Check Operation Pressures for Proper Refrigerant Charge: Improper refrigerant charges – too much or too little – can damage the compressor and will cause high electric bills, and reduced cooling capacity due to efficient equipment operation. Adjust Blower Components: Proper adjustment of blower and components is necessary for adequate airflow to assure maximum cooling performance. Monitor AC Cycle: Our trained Technician will assure that the air conditioner is cycling properly. Monitor Voltage & Amp. Draw on all Motors: Motors are designed to operate at standard voltage and amperage draw. By measuring amperage draw, problems can be identified before the unit fails. Check and tighten all Loose Electrical Connections: Loose electrical connections are a common source of problems which cause your electric parts to fail and your air conditioner to become inoperative. Clean and adjust Thermostat: To ensure even temperature control for your environment. Adjust Blower Components: Proper adjustment of blower components is necessary for adequate airflow to ensure your furnace can deliver maximum heating capacity and efficiency. Check & Test Safety Controls: Safety controls are essential for proper protection of the unit and your home. Monitor Furnace Cycle: We will assure that the system is cycling properly, and that controls are calibrated correctly. Inspect Gas Pressure: Proper gas pressure will ensure the most efficient and safe burner operation and reduces energy costs. Check for Cracked Heat Exchanger: As furnaces age, cracks can develop in the heat exchanger, which can allow dangerous gases (including carbon monoxide) to enter your home and endanger your safety. We will thoroughly inspect accessible components of your heating system to determine if this hazard is evident. Monitor Flue Draft for Safe Operation: An obstructed flue will cause products of combustion to enter your home. Adjust Heat Anticipator Settings: The heat anticipator in your thermostat determines how often your furnace cycles and will affect the cost of operation, as well as the comfort level. Check & Adjust Ignition Operation: A properly adjusted ignition assures that your furnace will start reliably all winter. Adjust Air Flow for proper Temperature Use: Properly adjusted blower speed will ensure efficient and reliable furnace operation and comfort. Check and tighten all Loose Electrical Connections: Loose electrical connections are a cause of equipment failure. Clean & Adjust Thermostat: To ensure even temperature control throughout your home. *Priority scheduling for standard repairs & emergency services only. Does not include BAM! Maintenance/Tune-Ups which are scheduled on a first come, first serve basis and subject to availability and weather.